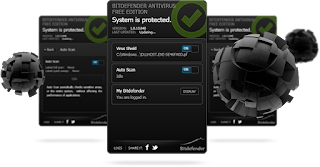 If you are looking for free antivirus with excellent protection, you may want to consider to install Bitdefender Antivirus Free Edition on your PC. This free antivirus is solid and it offers a feature which you hardly find in other free antiviruses, the ultra-quick 60 second scan. But here I would like to review a thing or two about its pros and cons. It has protective AutoPilot which always adjusts the defenses based on your PC’s activities. However, the Full Scan feature is slow. Some users might want to leave their PC for a while until the scanning done. Like most credible antivirus applications, Bitdefender Free edition uses advanced database of malware signatures. It updates its database on daily basis, representing the creator teams seriousness in developing this antivirus. Regarding to these days threats, Bit Defender antivirus engine also works like crazy. It constantly monitors the software behavior to determine which strange items pose a harmful threat for our PC. Bitdefender has cool instant-scan button on the main window so that you can operate the antivirus easily. You can scan your PC with one single click. Beside the Quick Scan and Full Scan feature, you can also download 60-Second Virus Scanner, which is separatedly installed. This feature focuses on security concerns and take less time to finish the work. Bitdefender may lacks of home network scanner feature, but the users can set the antivirus up to scan connected storage devices. And I think that’s what makes all PCs safe from intruders. Bitdefender is very cautious antivirus which protects us from the threats we possibly can get from Facebook friends. It keeps monitoring social networking activities. Just like other antivirus, I would like to review its performance and the system’s impact. Among the free edition antiviruses that I’ve ever tried, Bitdefender performs the longest time to complete full system scan, by far. But it is not a big deal for me since I can schedule full scans for the middle of the night, the morning I wake up my PC has been safe from viruses and malwares. However, it can put a big deal when you hit full scan button in the middle of the day. Installing Bitdefender is pretty simple and easy. After downloading 3 mb installed, you will need to create an account and enter your license number in the MySubscription page. But you do not need to fill it if you try it for free. 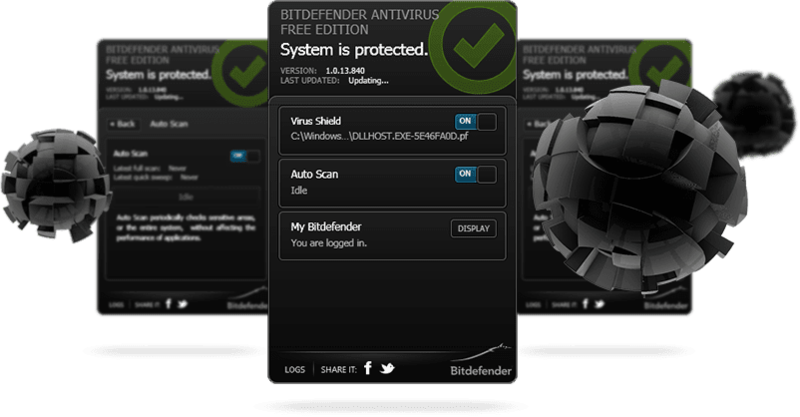 Bitdefender Antivirus free edition indeed offers excellent malware and virus protection. But it does not have the feature if you want to make a quick full scan.